Erivum Puliyum: Green Chilli Chicken | Green Chicken & Chillies for Saturday Snapshots !! Green Chilli Chicken | Green Chicken & Chillies for Saturday Snapshots !! Here's,introducing a new enthusiastic group of amateur photographers who have started to learn from each other(from experiences and practicing,shooting different subjects at different angles and composition). Frankly speaking,am a novice to this aspect and still stabilising my hands on my camera.But am enthusiastic about learning the different aspects of photography and I feel am in the right track joining Shweta & Siri's Saturday's Snapshot group.Thank u gals for the wonderful thought and this week that task was to get hold of chillies(red,dry,green or any).I chose the green ones and thought to give a try on green chilly chicken too.Though I wished to try this recipe with kanthari mulakku(bird's eye chilly) but couldn't get any here.If you can get those chilies then its better to use that,gives more flavor but make sure to adjust the spice as per tolerance.The recipe is adapted from here and this is a flavorful greeny chicken curry with the flavors of cilantro and mint leaves.Hope you guys give it a try and enjoy my green chillies shots too !! -Wash and clean the chicken under running water.Marinate using garam masala,pepper powder,turmeric and salt.Leave for half an hour. -In the meantime,grind the ingredients under the grind list to a coarse paste. 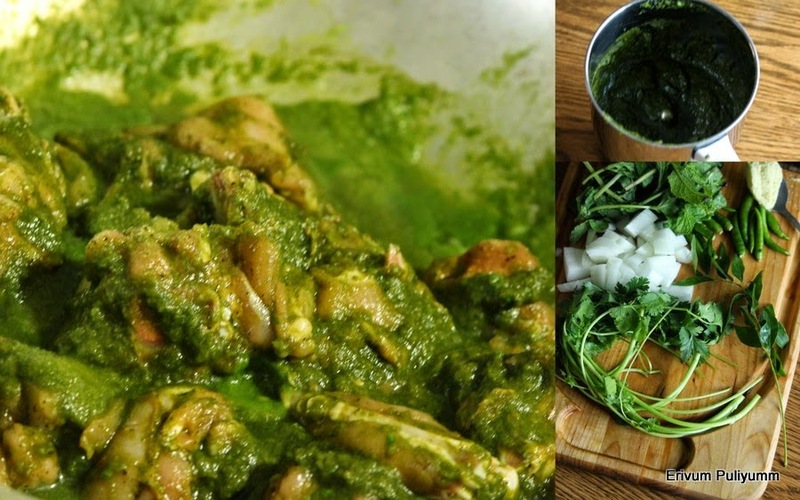 -Add this green paste to the marinated chicken.Leave for 10-15 minutes. -Heat another non stick pan,add butter.Saute the onions and curry leaves once butter is melted. -Add the cooked chicken with gravy and cook for 2 mins.Add yogurt on low flame and cook covered for another 5 minutes.Adjust salt. -Let the gravy thicken for another 3 mins and then turn off heat when butter appears floating on top. -Serve warm with rice/ rotis !!! * Butter is a must to this recipe as it tastes flavorful than oil. * Adding green chillies is as per tolerance.I added 10 green chillies which yielded a moderately spicy chicken but you can always alter this number. * Add a pinch of turmeric powder only else you will not get the bright green color. This recipe reminds me of curry leaves chicken. Awesome click of the chilli!! love this green chili shot and more chicken dish. Julie, Welcome to our photography learning series,am sure yo will have a fun learning there! The chillies look so popped out and excellent depth of field. Chicken should have been super hot! Your photos are better and better; great post! Looks awesome. Very well prepared. That's one spicy chicken dish!!! I bet it tastes delicious with rotis.